Viveltre proudly introduces our Salted Caramel gourmet flavored coffee in honor of our best selling Salted Caramel gourmet marshmallows. Sweet and salty have always been a winning taste combination and this coffee is no exception. Indulge in the flavor of classic English caramel accompanied by smooth, velvety notes and sprinkled with the boldness of sea salt. A caramel lover’s delight! 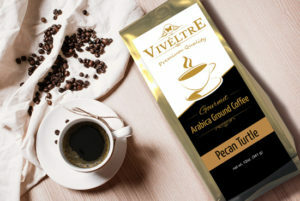 Viveltre gourmet flavored coffees are brewed with light roast 100% Arabica beans. Viveltre coffee uses green coffee roasters, brewed locally, in small batches to ensure quality. Indulge your tastebuds!